Tim Fletcher and his girlfriend, Michelle Schiau, dance before the start of the cross-country ski portion of Tuesday’s large hill individual Nordic combined competition at the 2018 Winter Olympics in Pyeongchang, South Korea. Fletcher was diagnosed with ALS 18 months ago and given between two and five years to live. PYEONGCHANG, South Korea — When Tim Fletcher of Steamboat Springs would tell a good story about the best of days to his young boys, he’d use to the phrase “like you read about” as if it were an exclamation point. Now the only way to hear those stories is to read them. Diagnosed in August 2016 with amyotrophic lateral sclerosis, ALS, Tim is dying. Different varieties of ALS work in different ways, some from the extremities in, some from the feet up. Fletcher’s goes from his head down. His started by deteriorating the bulbar muscles of his throat. The first life-altering consequence was losing his ability to talk. He still can see the world, still can hear everything and make perfect sense of it — all the information coming in at gigabyte speeds. Information going out, however, is restricted to the equivalent of a dial-up modem. ALS is a curse for the family, no question, and the boys have handled it according to their personalities. Bryan, 31 years old, has tried to keep a level head. Taylor, 27, burns a little hotter and has taken the last 18 months more emotionally. But, they’ve had time with their father, time to say goodbye, and they know not everyone gets that, so they’re gracious. They’ve seen Tim meet and love Bryan and his wife Nikki Fletcher’s daughter Ellery, born just a month after Tim’s diagnosis. They’ve mined their father for stories they never thought to ask for, facts they never bothered to wonder about and lessons they never paused to absorb. And Tim is also focused on making the most of the end of his life, “maxing it out,” he scribbled on his pad on a cold Tuesday night at the Alpensia Ski Jump Centre in Pyeongchang, South Korea. He spent 34 total years on ski patrol in Steamboat Springs, 27 years with Steamboat Ski Area and the rest, with a bit of overlap, at Howelsen Hill. He stuck on the patrol at Howelsen even after his diagnosis and up until his voice was too far gone for the job. He’s poured himself into doing so many of the things he’s always loved, stubbornly clinging to them with all his has. Even last summer he personally installed new pipes on his Harley and didn’t just make a point to ride it, but rode it 10,000 miles in the span of three months. He’s skied half a dozen times this winter either at Steamboat Ski Area or Howelsen Hill. He’s visited his sons in Park City, Utah, as often as he’s been able. He’s spent every possible moment with his granddaughter. But, there’s nothing he loves more than watching his sons — world-class athletes in Nordic combined — compete. Even though it was difficult, even though it was far, even though it was complicated, he wasn’t going to watch from home when his boys competed in the 2018 Winter Olympics in Pyeongchang — their second Olympics together and the third featuring at least one of his sons. Tim Fletcher knows he’ll miss so much, birthdays and weddings and powder days and motorcycle rides. He stood on a cold Tuesday night at the bottom of the Olympic ski jump in South Korea as the Olympic large hill Nordic combined event began. An American flag was tied to the fence in front of him, a button he’d had made, “Go Bryan and Taylor,” dangling from his jacket. He will miss so much, but he wasn’t about to miss this. Getting around isn’t as easy as it used to be for Tim. Soon after he lost his voice, he lost the ability to swallow, so now he’s fed from what amounts to a small box of juice, 8 ounces of fluid that’s injected by a syringe through a tube into his stomach. He needs the boxes wherever he goes. Tim and his girlfriend, Michelle Schiau, loaded up eight suitcases and bags for their trip to South Korea, four of them to carry on the plane and packed with those boxes and other medical necessities. She’d called ahead to check with the Transportation Security Administration and was assured that with a doctor’s note and a prescription it would all sail through airport screening, but it didn’t. Michelle and Tim were separated by agents at the Denver International Airport TSA checkpoint and grilled. Agents threatened to open each sterile box for testing, but in the end, settled for emptying every single bag to be carefully checked. It took an hour, but finally, they were on their way again, heading to another Olympics. 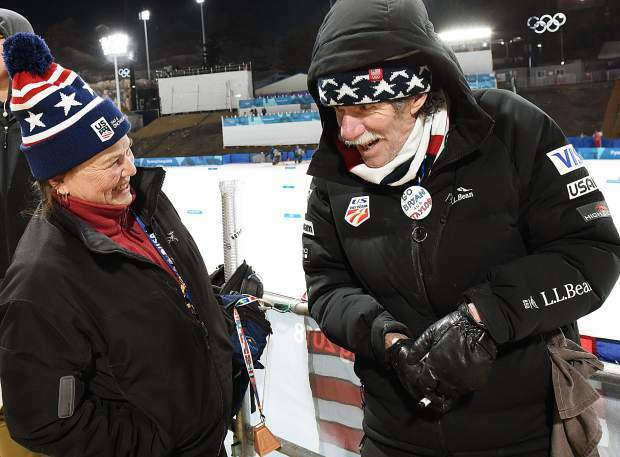 Tim has traveled the world cheering for his sons, both members of the U.S. Nordic Combined Ski Team and long-time fixtures on the World Cup circuit. He’s not one to bring them up in unrelated conversations, to brag about their achievements, but walls of his house are covered with photos of them competing, and he has a big trunk that contains a clipping of every newspaper article about their careers. He’s been to World Cups and World Championships, then to Vancouver, British Columbia, Sochi, Russia, and now Pyeongchang, South Kore,a to watch them in the Olympics. Even when he and Michelle were in Lahti, Finland, for the World Ski Championships a year ago, things were easier. Tim could still eat, so the packing requirements were much less demanding. Now, it’s constantly getting a little more difficult as his condition worsens. Michelle explained Tim needs help getting dressed and offered a weary glance down at the heavy motorcycle boots he wore Tuesday. Feeding alone takes an hour, then Tim needs to rest afterward. Getting out the door in the morning takes three hours. He’s more susceptible to cold than he used to be ,and midway through Tuesday’s event, Michelle slipped heating packs into his gloves. “The disease is definitely progressing,” Michelle said. Some of those issues reared their head in the first week of the games when Michelle and Tim went to the Nordic combined individual normal hill competition, the first of three Nordic combined events at the 2018 Olympics. Security at the venue wouldn’t let them in with the food and supplies, so Tim went almost the entire day without eating. “Just to get a little more of a glimpse of his boys. It’s amazing,” Bryan said. Things were easier Tuesday, for the second Nordic combined event. U.S. Team security lent a hand, and Michelle and Tim met a Korean site supervisor who proved aggressively helpful. Explaining it wasn’t a highly attended event, the supervisor spent most of the jumping portion of the competition hovering nearby, checking in occasionally to see if there was anything the couple needed. He came up big after the jumping event and before the ensuing cross-country ski race, wrangling a golf cart to drive Tim and Michelle to the venue, next door but still a considerable hike. They’ve gotten by on the courtesy of strangers, and as the clock ticked down toward the start of the ski race, cold and tired after a long day, Tim grinned wide and danced a jig, kicking his feet to the K-pop music blaring over the sound system. He was watching his boys in the Olympics. He was 5,998 miles from Steamboat Springs, and it was worth having traveled every one. It was a good day, like you read about. Skiing is one of Tim Fletcher’s great gifts to his sons. He’s always there, at the big events or even when they’re just training at Howelsen Hill. Taylor was struggling from the jump hill early this World Cup season and the Park City jumps weren’t open yet, so he came back to Steamboat for several days of training. Tim stood at the bottom and watched, scribbling out notes of encouragement as Taylor came in from each attempt. Tim strives not to be a coach in those sports, which he’s never regularly participated in himself. Alpine skiing is different. He taught Bryan and Taylor to ski soon after they could walk and now three decades later it’s still something at the heart of the Fletchers’ relationship. 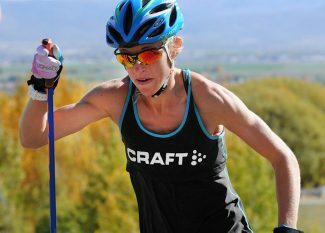 Bryan and Taylor used to spend all day ripping around Steamboat Ski Area as children, then they’d hang around as closing time approached to meet up with their father, who’d been working ski patrol. Then they’d team up for a sweep, head to the very top of the mountain and ski down looking for any late-afternoon skiers who needed help getting to the bottom before the end of the day. It’s not the family’s first medical nightmare. Bryan was diagnosed with acute lymphoblastic leukemia when he was 3 years old, and that actually helped open the door to Nordic combined. He only had a 15 percent chance of living, so what’s a little ski jumping going to hurt? The leukemia didn’t stick, in remission by the time he was 8, but the ski jumping did. Taylor then followed in his brother’s footsteps. Both found early success and grew serious about the sport as they worked though high school. 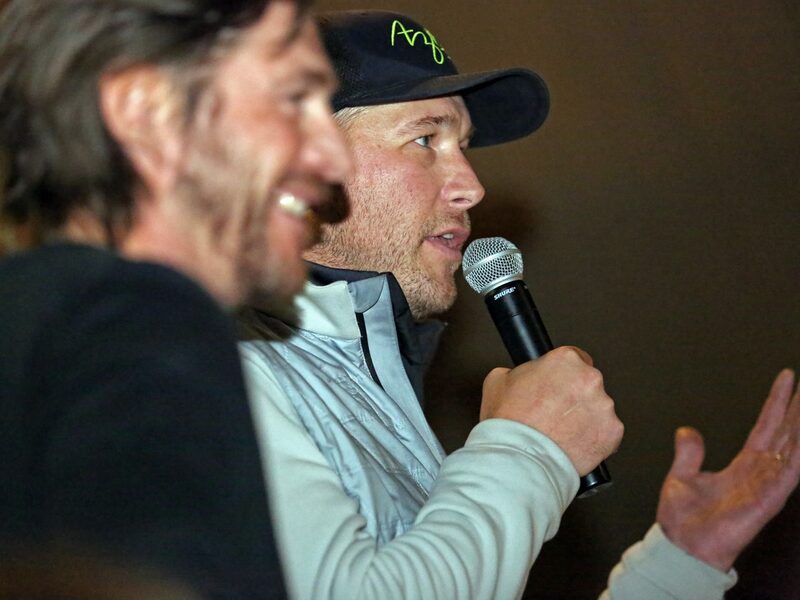 Bryan eventually left Steamboat Springs High School to graduate early from Park City Winter Sports School and was on the U.S. Ski Team by 18. Taylor made the U.S. squad after he graduated high school in 2008. They’ve each had success since, even if it’s been inconsistent. Taylor edged out Bryan for a spot on the 2010 Olympic team. That pushed Bryan to focus his efforts, and he won a World Cup event in 2012. Both brothers made the Olympic team in 2014 and both expected to make the team in 2018, though it took Taylor until the last weekend in the qualifying period to ensure he had a spot. Their dad never stopped believing, and even though some questioned whether or not the trip was wise, he was planning to come to Korea the entire time. Healthy, Tim Fletcher spent his winters skiing and his summers working as a contractor around Steamboat Springs. He was the guy who could fix anything, even after his sons and girlfriend started to notice some funny little things in his behavior. Sometimes he’d slur his speech as if he’d been drinking when he hadn’t. Things went from, “are we just witnessing our father age?” to real concern after a nasty bout with a cold battered Tim in the spring of 2016. Bryan and Taylor were home to relax for a few days after their competitive season and left worried. “Being sick wiped him out enough that the ALS symptoms became so much more pronounced. That’s really when it was like, ‘OK, there’s something else going on here,’” Bryan said. They feared a stroke and insisted he go to a doctor. Someone stubborn enough to travel around the world while battling ALS doesn’t just go to the doctor at the first suggestion, finally, Michelle made the decision herself, scheduling an appointment. ALS was immediately suspected, but doctors worked through a long process of elimination, crossing out nearly every other possible ailment. Finally, in August, there was only one disease left. It was terrifying for everyone. Tim and Michelle met his Grand Junction-based neurologist in Craig for the final word, and then the couple stopped to eat lunch at an Italian spot on Craig’s main drag. There was a little girl at another table, just about a year old. 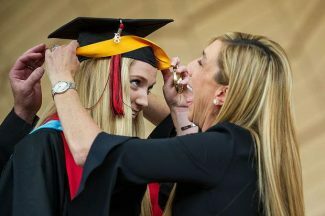 Nikki Fletcher was at that point a month away from giving birth to Ellery. Tim Fletcher’s the kind of guy that will talk all day, all week even, about motorcycles or skiing, talk until his audience understands everything there is to understand. He’s not the kind of guy to talk about his emotions or his feelings, and certainly not to cry, but the little girl in the restaurant, the vision of his to-be-born granddaughter and the deadly diagnosis, it all crashed together there over pizza and a beer. The resolve to make the most of whatever time did remain came later. In that moment, however, he cried. Surely any relationship between grandfather and granddaughter is sweet, but the Fletchers insist there’s something else there. Ellery Fletcher is a 1 1/2 old and lights up when her grandfather walks into a room the way she does for few others. They bond, perhaps in their shared frustrations with verbalizing their thoughts, or perhaps their mutual appreciation for her father. The thought alone breaks Bryan down. The Fletchers have never been much for photos. Tim would come home from a three-week adventure with maybe three shots. His sons, at least, are trying to change that now. “I have more pictures from the last 18 months than the last 10 years,” Taylor said. Bryan’s been sure to take pictures of his dad and his daughter together, playing, dancing, interacting. “Just so we have the memories, so I have the memories to show Ellery who her grandpa was and the time she got to spend with him,” he said. They’ve been digging, too, asking about growing up in the military bouncing between bases in Europe, about ski patrol exchanges in the Alps and motorcycle trips around the United States. They haven’t been able to speak, to actually speak, to their dad for a year. The voice went so fast. First, it was just hard to understand, but soon after it was impossible. Bryan stopped deleting his old voicemail messages from his dad. They’re not particularly special messages, not big moments, but they are moments, and they know there are only so many left. He tries not to play to them often. His dad’s still here, still scratching out notes, sending text messages and, when the mood strikes, dancing in the snow. Somewhere in that is one of the last lessons Tim Fletcher’s hoping to teach his sons. They’re not ready for him to die, he wrote. No one could be. But, they’re all learning the value of a month, a day and a moment, and especially the value of a trip around the world, of making it all count. 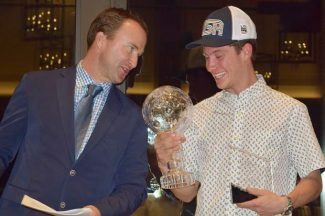 Both brothers competed last week in the normal hill competition, but Taylor sat Tuesday’s event out as another U.S. skier took his spot for the night. Jumper after jumper streamed down the hill. One group of nearby Germans wore huge, fake mohawks painted like their national flag. A group of Japanese fans stood close and each waved a flag. Norwegians, Austrians and Swiss filled in around Tim. When it was Bryan’s turn to jump, he leaned over the fence in front of him. He didn’t yell. He can’t. But he shook a cowbell and he grinned ear to ear as his son flew down the hill in front of him. Bryan paused as he was leaving the landing zone, looked back at his father and the rest of his family, his mother Penny Fletcher and the families of other Steamboat athletes cheering close by, as well, and he waved. Tim would dance through the night, at the jumping venue and later during the cross-country race, smiling wide and far from home but never happier. This is what he came for, “what I’m living for,” he wrote out. Later, Bryan warmed up for the cross-country ski race on the snow as Tim looked on from the stands. Bryan, set to retire after this season, went on to place 17th, and both he and Taylor will race together one final time Thursday in the Nordic combined team relay event. How does it feel, the trip, the competitions, seeing his boys compete again together in the Olympic Games? Tim didn’t need a marker. He simply tapped his heart. It was a moment in the chaos of the Olympics, a moment for the Fletchers to remember, a moment like you read about.